Ready for a quick and nutritious dinner that still has that ‘down-home comfort food‘ taste? 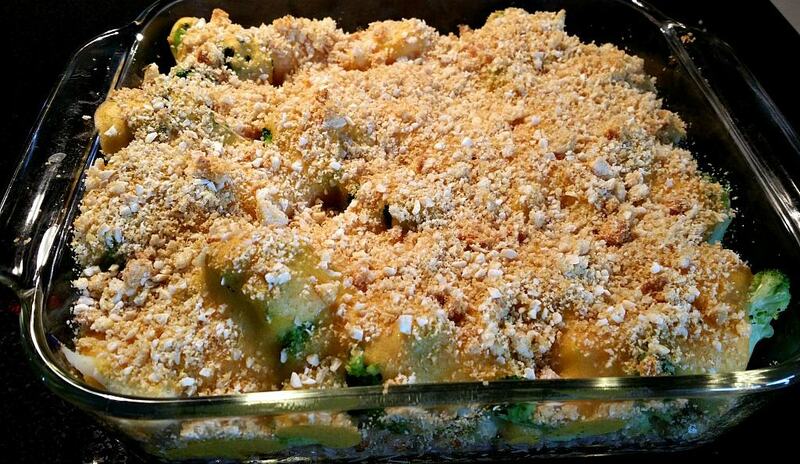 Then you’ll have to try this Vegan Rice and Veggies Au Gratin. 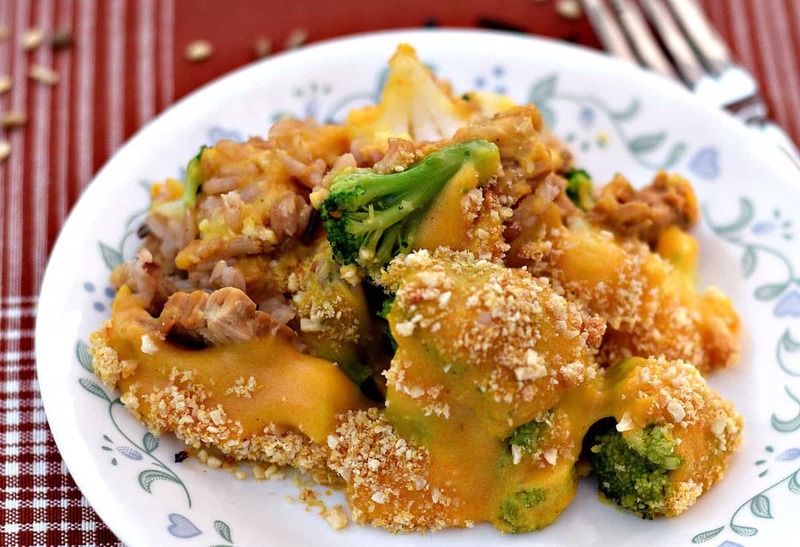 Brown Rice, Tempeh, and Steamed Veggies – smothered in a rich Vegan Cheese Sauce. And prepared in a single 8″ Baking Dish….can you say easy cleanup too? 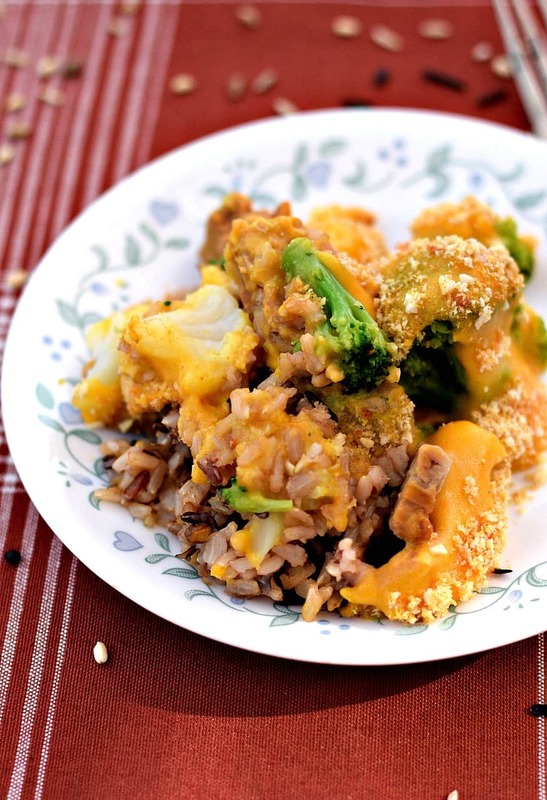 Nothing screams COMFORT FOOD louder than Cheesy Vegan Rice and Veggies! With a block of Tempeh thrown in for good measure……. Don’t worry if you’re not a Tofu fan – Tempeh tastes nothing like tofu and has a textured, nutty flavor I’m sure you’re going to love. Tempeh (pronounced TEMP-ay) is made from fermented soy (like Miso) so it has a LOT of nutritional benefits….namely a good source of Protein and also a fair amount of Calcium, Iron, and Fiber. As well as being a good source of nutrients, tempeh is also an excellent source of live cultures known as Probiotics. These are the good gut bacteria you want in your system and are usually found in fermented foods like Yogurt, Miso, Sauerkraut, or Kimchi. It’s made from cooked and slightly fermented soybeans and formed into a patty – kind of like a veggie burger. Tempeh can be found in the refrigerated section of many grocery stores including Whole Foods, Trader Joe’s, Asian Grocery Stores, and even Fred Meyers (Kroger). When buying the flavored varieties, check the ingredients closely as some have added oils. I told you this is going to be a simple recipe – and it is. First we’re going to lay down some cooked Brown Rice in the bottom of an 8″ Baking Dish and then layer a package of Tempeh on top. I marinated the Tempeh first in about 3Tbs of Soy Sauce. 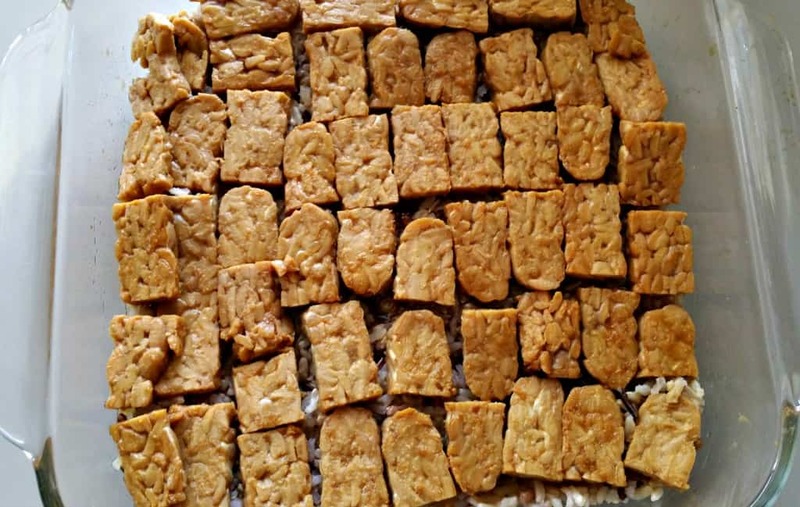 Spread Tempeh evenly over rice. Then we add a package of Frozen Veggies. 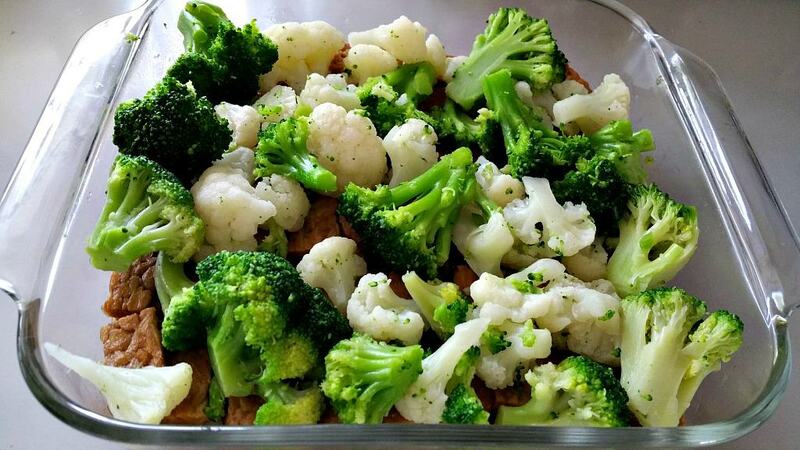 I used a 12oz package of SteamFresh Broccoli and Cauliflower. Microwave the bag according to the directions, but only for about half of the instructed time. Mine were still a little cold when I added them to my dish so they would be perfect after baking. See? I told you this was going to be easy! Now pour on the CHEESE! I used about 2 cups of my homemade Cheese Sauce. You can find the recipe for that here. Ahh….nice and gooey! Looks yummy just like this! Finally, I added about ¼ cup of seasoned bread crumbs. I took a few slices of Whole Wheat Bread and dried them out in the oven. Then pulsed them a few times in my Food Processor until I had about 1/4 cup of crumbs. Then I added 2 Tbs of Vegan Parmesan to season. Note: Vegan Parmesan is a simple mix of Raw Cashews, Nutritional Yeast, Salt, and Garlic Powder that I store in one of those old Kraft Parmesan Containers. We use it on Spaghetti, Pizza, Toast, everything! And sprinkle on the bread crumbs. Bake in a 350° oven for 20 minutes. 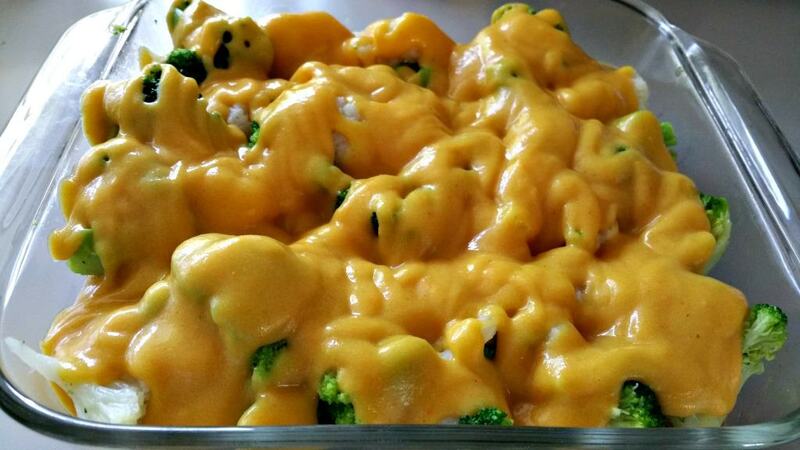 Mmmm….Gooey, Cheesy Broccoli and Rice….. just like momma used to make! 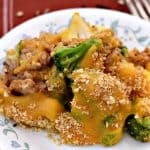 This VEGAN RICE and VEGGIES AU GRATIN combines Brown Rice, Tempeh, & Frozen Veggies with a rich Vegan Cheese Sauce for a quick and nutritious dinner. Chuck, the cheese sauce is listed twice…is that just a typo? Will be making this today, thank you! I love how flexible this recipe is. I stumbled over here looking for a use for my leftover vegan cheese sauce (from “cheesy mac”–and I just couldn’t bring myself to do pasta again). I didn’t have frozen veggies, so I lightly sautéed broccoli, carrots, cauliflower, and kale. I didn’t have quite 2 cups of sauce, so I supplemented with cheddar daiya cheese and seasoned it all with old bay. It worked fine with firm tofu (sliced and marinated in soy sauce and agave). I can’t wait to try it with tempeh. A success with the whole family. Thank you!